House manager, Bruce Lee puts on a film on the DVD player. Television helped give people the sense of “warmth” of living in a real house. Bucharest, 2013. Deep in the underground below the Romanian capital city of Bucharest exists a network of tunnels and sewers. This underworld is home to a marginalised community, known in recent years for their rampant drug abuse and high susceptibility to infections. According to Channel 4’s recent documentary almost all the inhabitants of these dwellings test HIV positive, while a quarter have TB. Photographer and anthropologist Massimo Branca and his photographer friend Igor Marchesan dedicated months of their time to getting to know this community from a more familial perspective, steering away from the mass statistics of mainstream media. Their resulting collaborative project Inside Outside Under Bucharest chronicles the daily lives of the people they met and the intimate relationships they forged there. Massimo grew up in a small city near Venice in Italy, though has been semi-nomadic for the past few years. He was drawn into the underground world under Bucharest when a friend of his, fellow photographer Igor Marchesan, invited him on a backpacking trip around Romania; both friends agreed that they should spend at least a couple of months out there: “When we left Italy, we had no plans about what we were going to do, but we were guided by curiosity and passion. 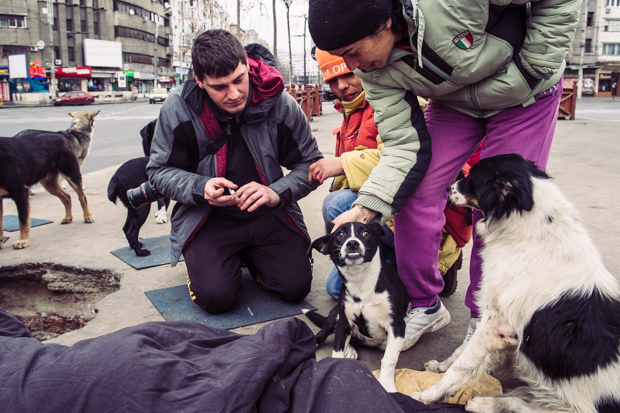 During our short stay in Bucharest, we accidentally bumped into the community of Gara de Nord, it was then that we decided to deepen our knowledge of the issue”. 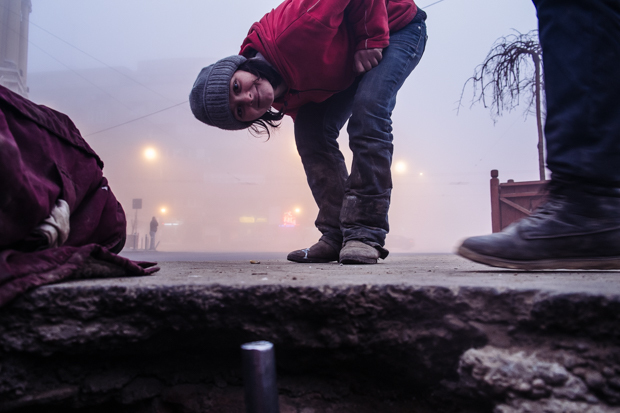 The two friends passed four months living in the sewers, with a shared vision of documenting this community. What began as a collaborative effort continued as a personal long-term project, to which Massimo dedicated four more months. 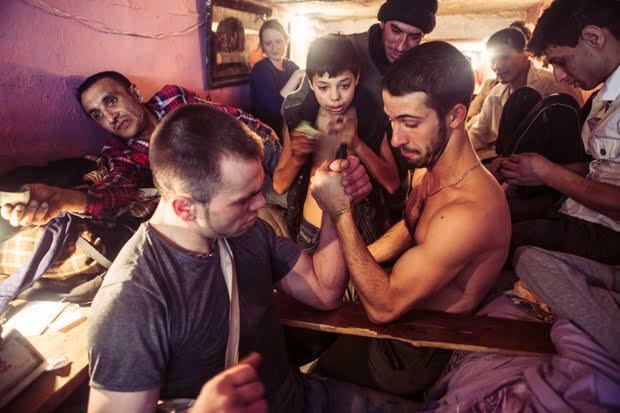 Inside Outside Under Bucharest focuses on one of the most marginalised communities in Europe; “It is about people, compassion, empathy, instability… in other words: life as humans” explains Massimo. Together, the pair documented a complex reality where drugs and confinement are symptomatic of one of many forms of adaptation to marginalisation. 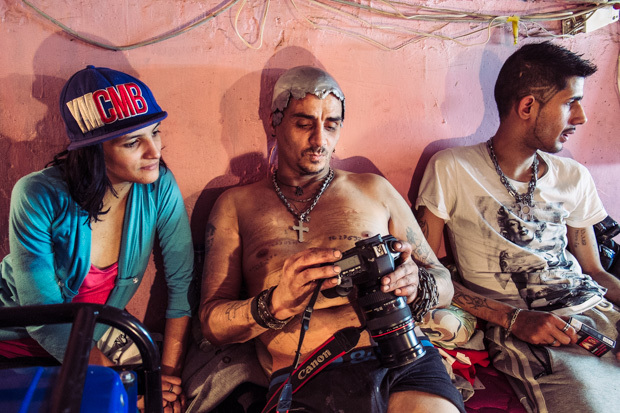 By living with these people, their hope was that the viewer would able to imagine what life is like in Gara de Nord, “without their eyes being clouded by pity, judgement or fear”. 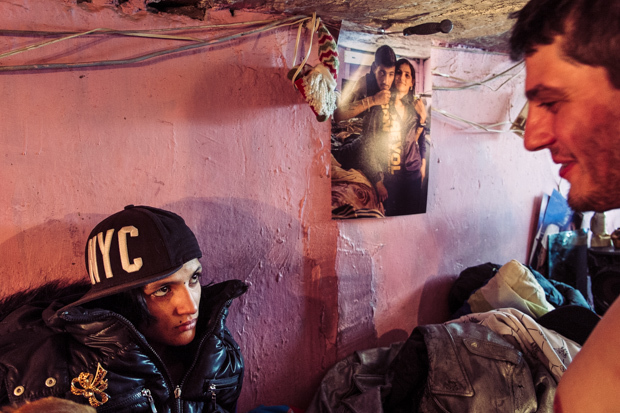 The everyday lives of people in this community were often familiar: “In summer 2013 we had a cooking competition inside the tunnel, Italy vs Romania. I cooked ‘spaghetti all’amatriciana’, which was a bad choice, since there was no colander and the locals were not so used to eating spaghetti. We lost the competition, but had a lot of fun”. In order to capture intimate, occasionally dramatic moments while simultaneously evoking a sense of being present, the photographers allowed the relationships with the people they met there to evolve naturally over time. This was in part dependent on their own fluctuating curiosity and confidence. Initially they were “just allowed” to take photographs, but when people within the community became more comfortable with their presence, they found they were able to recognise and capture the more spontaneous gestures of daily life. “By the end we were so close to them that they stopped thinking of us as ‘crazy’ photographers, but as real friends”. To convey how close the community felt to Massimo and Igor, several months after they left, many asked them to return; several even offered to raise money to pay for their airfare. There were some moments during which both photographers felt they were losing track of themselves, their reference points, and felt as though they were in danger of “drifting”, “I’m actually not 100% sure I have completely overcome this sense of disorientation” admits Massimo. The project itself evolved with time, taking them both in directions that neither of them had preconceived. They began to follow the stories of individuals and families, trying to determine what causes so many people to live in such conditions. Unfortunately, this story terminated in July 2015, when local authorities arrested almost all the inhabitants of these tunnels close to Gara de Nord. The emotional bond the two photographers had formed with many of the local inhabitants meant that they were initially hesitant to publish the images, and didn’t do so until they had made a conscious decision regarding “what to say” about the community. In the near future Massimo and Igor are planning on releasing a book to showcase a selection of the material they have been collecting during the last three years: “The book will probably be the best way to condense the experiences, observations and photographs we’ve been collecting during this life-changing journey. It will in the very least serve as a reminder of a very important part of our photographic career and our personal lives, I’m quite sure the project will come again in our thoughts, even if it will likely appear in new and different shapes”. Bucharest, 2014. 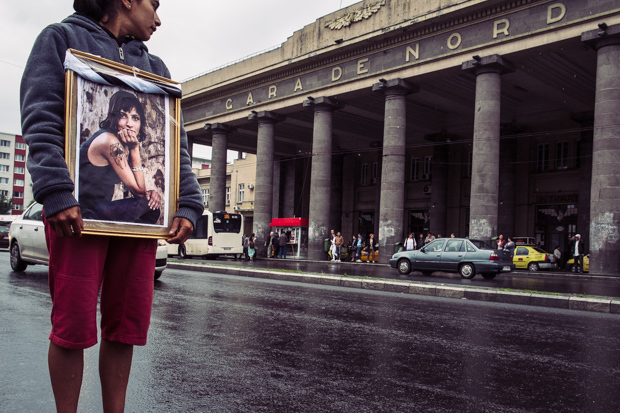 A portrait Massimo took in summer 2013 goes around in procession in Gara de Nord, where a friend called Catalina spent most of her life. Wintry sunrise at Gara de Nord. The text “vino cu noi” (“come with us”) stands over the head of Azavoae (19, grown up in orphanage until 18). Under the street, the tunnel that used to be “home” to many. 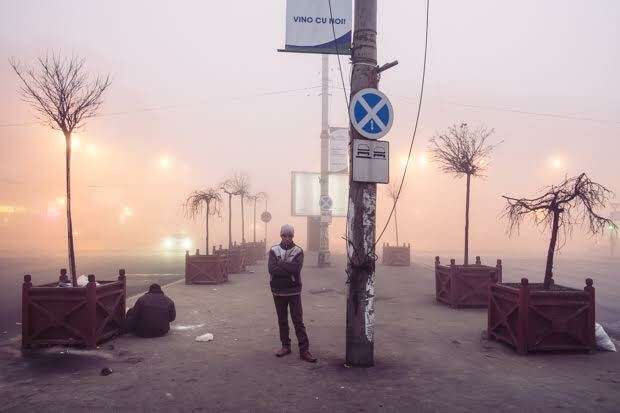 Bucharest, 2014.